When inserting the battery, ensure the device isn't connected to any device or power source. Never use tools, knives, keys, pens, or any type of object to force the battery cover open or to remove the battery, as doing so could puncture it. 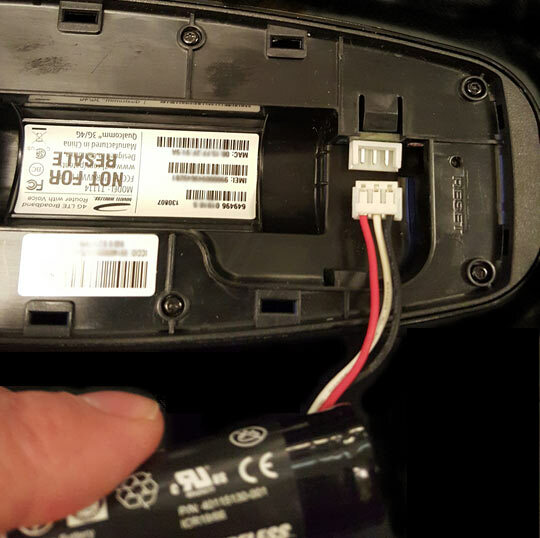 Press your finger against the battery cover removal tab on the underside of the device then lift and remove cover. Plug in and insert the battery. Keep the red cable to the center of the router and ensure the metal contacts are facing up. Vuelve a colocar la tapa de la batería. Set cover on the LTE Internet and Home Phone where the notches align, then press on the cover until it clicks into place and is flat across the entire bottom surface. Plug the AC power cord into the power port on the back of the device. Enchufa el otro extremo del cable de energía a un tomacorriente eléctrico apropiado.